Over a year ago, on the recommendation of more than one person, I purchased the Kindle version of the book Shepherding a Child’s Heart by Tedd Tripp (on sale right now for $1.99!). I read a few chapters, but then became side-tracked with other things and have yet to finish the book. 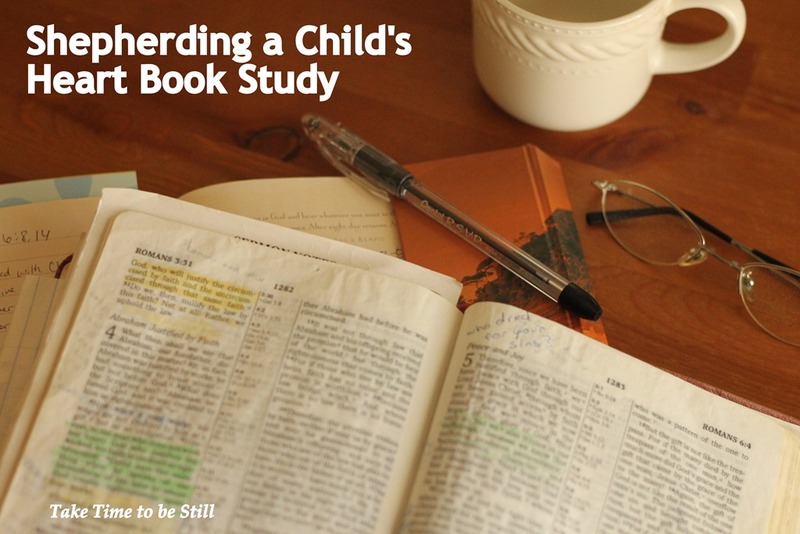 So when I heard about the Shepherding a Child’s Heart Book Study at Our Out-of-Sync Life, I was very excited to dig in and finally finish the book! The main idea behind the book is reaching a child’s heart, not just correcting his or her actions. Correcting the behavior (hitting, arguing, throwing tantrums) without addressing the root issue (selfishness, pride, anger, etc.) will never result in effective, long-term change. From a Christian perspective, the root problem is sin, and the cure is the Gospel. So, to keep myself accountable to completing the readings, I will be posting my thoughts and reactions here over the next few weeks. People frequently ask if I expected my children to become believers. I usually reply that the gospel is powerful and attractive. It uniquely meets the needs of fallen humanity. Therefore, I expected that God’s Word would be the power of God to salvation for my children. But that expectation was based on the power of the gospel and its suitability to human need, not on a correct formula for producing children who believe. This assertion rang true for me. Just this past weekend I had been discussing with some other ladies how we wished there was some way to ensure that our children come to salvation. We want this for them because of the tremendous difference the gospel has made in our own lives and because we know that our hearts need cleansing from sin in order to be reconciled to a Holy God. But of course, as Tripp points out, there is no magic formula. We can do everything “right” and still have children who don’t believe. After all, God’s children, Adam and Eve, had the perfect Parent, and yet they still chose to rebel. Sometimes this leaves us feeling a bit hopeless. However, I really liked the way Tripp turned the tables from putting our hope in what we as parents can do, and instead trusting in God and His Word because it is “powerful and attractive” and is “uniquely meets the needs of fallen humanity.” While I have a responsibility to make sure my parenting is in line with Scripture and that I am pointing my children toward the Gospel, ultimately their salvation does not rest on my doing everything “right.” I must trust that God and his Grace are sufficient and that the good news will draw my children’s hearts to Him. If you are interested in joining the study yourself, you can find all the details at Our Out-of-Sync Life. And please share your thoughts here as well! We’d love to hear from you! This entry was posted in Midweek Inspiration and tagged Midweek Inspiration, Shepherding a Childs Heart by Julia. Bookmark the permalink.